If it's true what they say - cleanliness is next to godliness - then in your quest for workplace spirituality your workspace can transcend to new levels with a little desk organization. When you need a cord cleanup, we present to you the Ultimate Wire Management Kit. 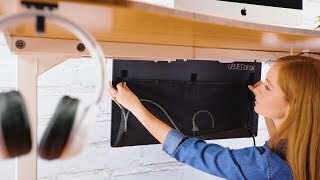 You'll get a 29-inch wide modesty panel, which reroutes and shelters your cords while increasing privacy underneath your desk. Add in a six-outlet surge-protecting power strip, desk-to-wall cord organizer, under-desk hook, cable management clips, screw-in cable mounts with reusable cable ties, and cable mounts, and you'll have ideal cable coordination at your desk thanks to one handy kit. How does this help organize my desk? Our Ultimate Wire Management kit gives you the tools your desk needs when your workspace organization is lacking. The kit comes with a 29" wide modesty panel, a 6-outlet surge protector power strip, desk-to-wall cord organizer, an under-desk hook, three cable management clips, and cable mounts. We find all of these pieces work together to help you reroute cords and tuck them away where they are less likely to get snagged when you adjust your desk. How is this the "ultimate"? Over the years our designers have developed the best tools in desktop organization, combining these products in a single kit to help you keep your desk clean. What we have here is what we consider the ultimate in tools necessary to add a little order to desks, whether sit-stand or fixed-height. We think you'll agree! Is this different from the Basic Wire Management Kit? We added a 29" Modesty Panel with Wire Management to the BWMK to give you total organization and privacy in a single package. How do I know if this fits my desk? The pieces in our Ultimate Wire Management Kit were designed to fit on most desks. The only thing you would need to measure your desk for is to see if the 29" Modesty Panel with Wire Management will fit on the back of your workstation. Power all of your devices with the optional UPLIFT Clamp-on Surge Protector with 2 USB ports, which clamps onto desktops up to 1 3/8" thick, or clamps onto desk frame ends for use with thicker tops.